On 31 December 2011, I came to the end of a year-long project to record a screenshot a day on Tumblr. This was prompted, in part, by a post on Martin Weller’s Ed Techie blog about the tools used by digital scholars. I can sum up some of the key tools I use fairly quickly, just by listing the ones that appear on my Firefox one-click favourites toolbar. They include blogs, the university library, Google Scholar, Twittter, email, Flickr and YouTube. These seem the most obvious at first glance, but are they the ones I really use all the time? My year-long project overlaid screenshot upon screenshot, to give a sense of the interconnections between my online work on different days. The original idea was to do just a whole-screen grab, but that would often include people’s names and photographs that I didn’t necessarily want to share globally. So I made a selection each day, and only occasionally showed my entire desktop. I tried to select a key representative image each day – when I was on holiday I uploaded photographs, and when I’d had a day mainly offline I tried to find a website to represent it. The piece evolved into an online diary documenting my year – and I’m now continuing the project into 2012. The picture above is my image for 3 January 2012, which captures my entire desktop. 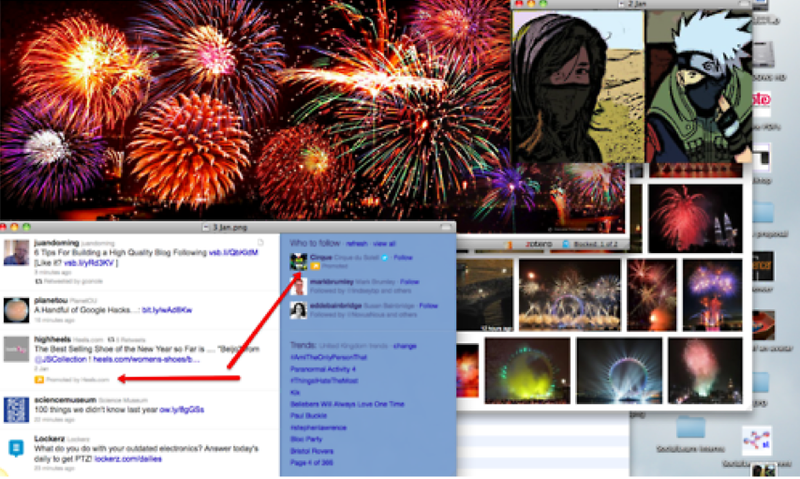 It brings together international events (New Year firework pictures from Google Images), personal interest (a mashed up manga-style pic that used iPhoto, Comic Life, Google and screen Grab), national events and online tools (I note the changes in Twitter with a Jing-ed picture, but also note the trending hash-tag on the racially motivated murder of Stephen Lawrence and reactions to the final verdict after 18 years). When I have some spare time, I’m planning to look back over the year and try some analysis. This entry was posted on January 9, 2012, 10:51 am and is filed under Blogging. You can follow any responses to this entry through RSS 2.0. You can leave a response, or trackback from your own site.